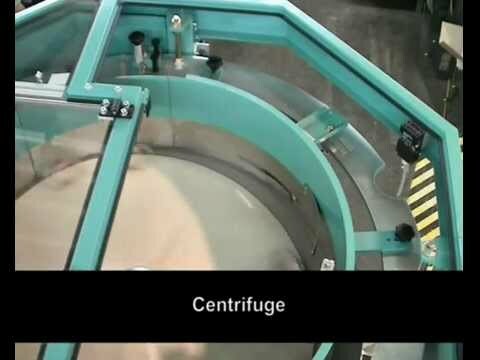 Operation Description: Components are bulk loaded into a special elevator hopper dosed into a centrifugal feeder. The Centrifugal feeder feeds the component end to end at random onto specially designed orientation rolls, the rolls counter rotate and are set at a pre-determined gap to suit the battery width. The battery has a small lip which catches in the rolls and hangs the component axis vertical. Due to counter rotation of the rolls the battery cannot jam, any unsorted batteries are rejected and recycled back into the system via a flighted conveyor. 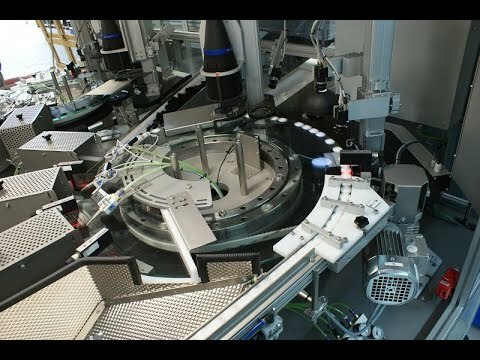 The batteries are then turned through 90 degrees via a gravity track and fed into the customer’s assembly machine via a rotating scalloped wheel. Machine efficiency expected in < 99.9%. Operation Description: The components are loaded manually by an operator into a bulk hopper and dosed into a centrifugal feeder which feeds components flat on track onto an outfeed conveyor. The Conveyor transfers the components from the centrifugal feeder onto a dead section of track. Back pressure from each coin pushes the product the length of the dead section. 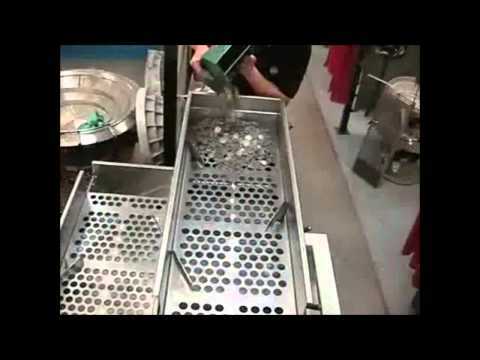 Once the dead section is completely full the coins are pushed at 90 degrees to the direction of feed off the dead section onto the existing process conveyor. The process conveyor is used to feed the components into an industrial furnace. The correct minimal gapped rows of coins reduce furnace operating time thus speeding up the process manufacturing time and saving energy. 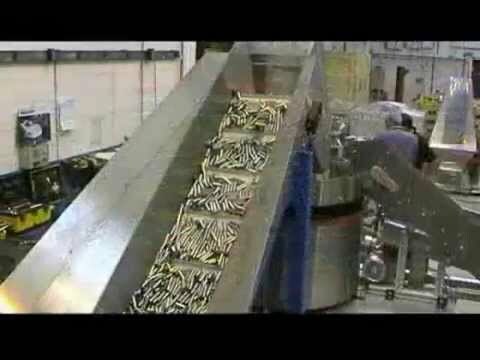 Feeding Rate: A 1370mm single row of components to be discharged every 6 seconds; The feed system gives a consistent spacing of 3.3mm between rows. Operation Description: The components are loaded by a bulk hopper type BFK150 into a bowl feeder operated via a non-contact, ultra sonic, bowl level sensor. The bowl feeder orientates the components axis vertical at random before discharging them onto a conveyor fitted with a timing wheel. 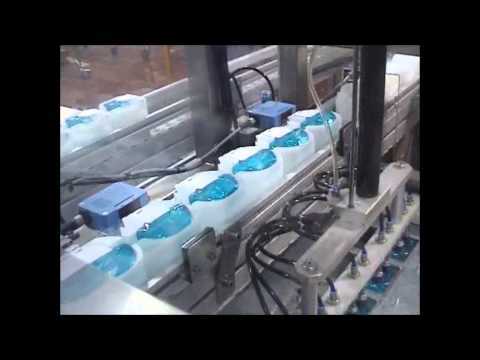 After the component has been spaced onto the conveyor it passes through an inspection station. The inspection station incorporates two OCR (optical character recognition) cameras mounted on opposite sides of the conveyor. Depending on the results of the inspection, the main system PLC triggers a divert cylinder and puts the component into a chute relevant to each component. Operation Description:The spray heads are to be fed to a customer rotary indexing machine for assembly. The sorting is carried out on 8 individual tracks on a linear feeder. The advantage of this concept is that the speed of the individual tracks can be reduced and disruptions on individual tracks do not lead to outage of the machine. A swivel base serves to join the tracks. This solution which is scalable for other capacities requires no air sorting. Operation Description:Linear sorting with multi-track pre-sorting and combination on one track. Return feed of pieces with a Venturi nozzle in the special receptacle.